Great start mate! The transfers will be interesting! 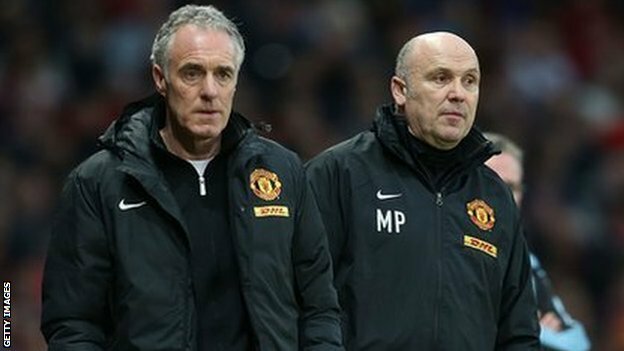 Familiar faces and names in the likes of Mike Phelan and Eric Steele and a host of others were left out of a job today. Around a dozen staff are believed to have had their contracts mutually terminated to immediate effect, following the arrival of Éric Cantona as the next manager. Rumours suggest that there were a number of reasons for this mass exodus, being that most were close friends of Sir Alex Ferguson and opted to pursue careers elsewhere following his departure. Others suggest that there is some friction in the backroom with many staff skeptical about working under such an inexperienced manager. It is however, believed that Éric has been working swiftly to radicalise the dugout and bring in some fresher faces to ais behind the scenes. Besides that, transfer rumours are now also ablaze in the off-season as Man Utd will look for a way to claw back the quality gap between them and rivals Manchester City. It seems like Cantona will have a lot to answer to in his coming press conference. Executive vice-chairman Ed Woodward said: "I'd like to thank Eric and Mick for the enormous contributions they have made to the success of Manchester United in their time here. Their professionalism, ability and diligence have been a credit to them. They are top-class football men and everyone here wishes them well for long and successful careers in the game." @KingPadster: I must admit, I find myself doing the same! @Justice: Thanks a bunch, I'll try! @Suso30: Haven't even made them yet! @mattgullidge: Thanks, I was hoping it would be! Are you gonna do a David Moyes and get rid of Rene Meulensteen too? Aww Phelan Who are you going to replace him with? Tassotti? "Sometimes the media like to dispute whether or not a player can always make a good manager. For me it's got to be about the way they've seen the game, even in their playing days. You can tell if someone has a great footballing brain and I think a legend at the top of his game like Cantona will have gained those sorts of insights. I look forward to working with him, and seeing how he will blood through the younger players coming through here. Of course all of us are excited to get to know him and to meet him because when we some of us were young lads, he was the one on our screens- helping our club to win trophies." "Ideally, you know, you want to contribute to the club till your wheels fall off. But I feel good, and I feel like I can still compete at the top level, so hopefully I can sort out something in the coming months. Some managers like to do things different ways, but the experience that I've got will always be a massive asset to the club. I'm not even thinking about retirement yet." @Kane: He will be sorely missed. @Arvind: That's the plan, hopefully! Man Utd seeking Spanish Connection? Francesc Fabregas, well-known throughout England for his exploits under Arsene Wenger's guidance, has been linked with a sensational switch to Mancunian red as reports stir that he is unhappy at Barcelona. It is a well-known fact that he remains an understudy to the likes of Xavi, Iniesta and Busquets in the meantime, but many see him as the perfect successor. The media are starting to wonder whether a player as good as Fabregas can ever be happy with sitting in wait for the Barca talismans to move on- and perhaps Fabregas wants some action of his own. The Manchester United midfield has often been looked at as having lots of guile, commitment and hard-work in the form of players like Fletcher, Cleverley and Carrick- but lacking in creativity which has prompted the re-modelling of Giggs' game to sometimes play there, and Anderson to play a creative role to inconsistent effect. Fabregas is seen by many as the piece that completes the midfield puzzle and could well turn it into a world class midfield. Rumours are that with Fabregas himself unhappy, it would take something over £35 million bid to even catch the interest of Barcelona, who smacked a £174 million release clause on him when initially re-signing him from Arsenal. Funds at Manchester United are thought to be reasonably favourable as they continue to do well as a brand. Now that would be some signing! You are reading "Dynastie de Rouge, Éric Cantona - Manchester United".